How will you get to Ireland? 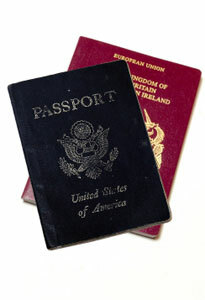 Air travel to Ireland is the most common way to enter the country. However, you may want to travel to Ireland by ferry, or you may even decide to take a cruise to Ireland. If you choose air travel to Ireland, you will be amazed by the many shades of green you see from the airplane window on your final descent. If it's cloudy or raining, just remember - the rain provides all the color you will see during your visit! We’ve flown in to Dublin Ireland Airport in the east and Shannon Ireland Airport in the west. You will most likely find a flight in to one of the two, although there are three other international airports. The airport in Cork Ireland is on the south coast, Knock airport is in the northwest, and Belfast airport is in the northeast. If you’re traveling to Ireland from England or another neighboring country, you might also come in at Derry, Donegal, Galway airport or Sligo. Aer Lingus offers most of the direct flights to Ireland from North America and the U.K. It’s fun to fly Aer Lingus; the shamrock on the plane and the Irish accents of the flight attendants get you in the mood for your visit. You also watch videos about Ireland on the way in. Other major airlines have direct flights, too. 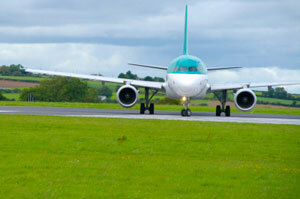 Ireland air travel within the country is offered by Aer Lingus, Aer Arann Express and British Airways. We have also flown to Dublin Ireland Airport from London and Glasgow on Ryanair, which is famous for low airfares to Ireland from other close European destinations. For example, a cheap airfare to Ireland from Amsterdam or cheap flights from Spain to Ireland are available year round from Ryanair. How long does it take to get to Ireland? The flight from Chicago to Ireland is about 7.5 hours. It takes 6.5 hours from New York to Ireland, 10 hours from Los Angeles to Ireland and an hour from London to Dublin. You should book early and on-line to get the best prices on air travel to Ireland. You may be lucky enough to find cheap airfare to Ireland; each flight has a few lower priced seats. Off-season air travel to Ireland is another way to find cheap airfare to Ireland. If you don't mind cooler weather, beat the crowds and save money by traveling from September through April. 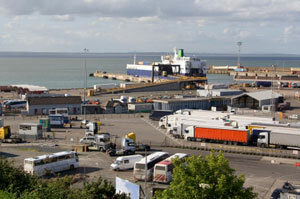 You may want to travel to Ireland by ferry if you are coming from a location in the United Kingdom or France. Ferries come into six main ferry ports; two in Northern Ireland and four in the Republic. You wouldn’t necessarily envision Ireland as a cruise destination, but cruises to Ireland are becoming popular. Getting to Ireland is your first exciting step; experiencing Ireland when you arrive is next.